The Kapisanan administrative office is not unlike a jeepney. This symbol of Filipino culture is a communal vehicle that facilitates the movement of locals – so too does the staff at the K. Inside the Kapisanan Jeepney, the personnel are the drivers that skillfully steer our arts and cultural programming. Interested in joining our team? CLICK HERE to see opportunities! Interested in volunteering at the K as a Junior Coordinator? CLICK HERE to see opportunities! In her eight years as the co-founder and Executive Director, Caroline Mangosing has grown Kapisanan Philippine Centre for Arts & Culture into a multi-arts institution using a very specific youth-for-youth model. Her vision and program development have garnered her several awards including Exceptional Services Rendered to Community in Culture and the Arts (National Ethnic Press & Media Council of Canada) among others, and most recently her work with Kapisanan has been shortlisted for this year's Toronto Arts Foundation Youth for Arts Award. 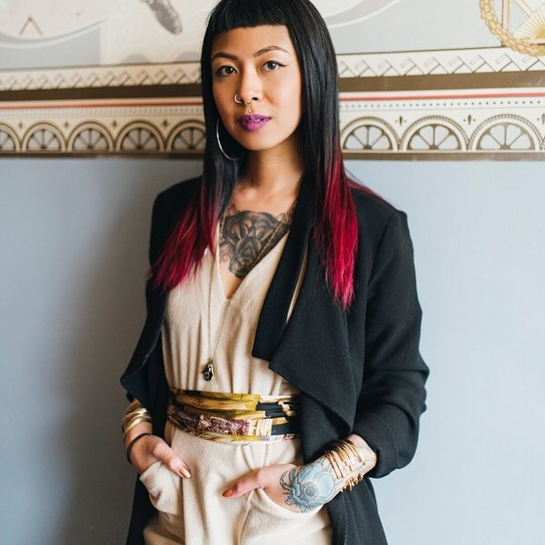 Moving forward Caroline will be pursuing her entrepreneurial ventures, one of them, VINTA, a social enterprise created within, and benefitting Kapisanan, centred around an exclusive brand of contemporary Filipino cultural fashion that she designs and sells all over North America. Kapisanan is a brave space which integrates an anti-oppression framework for young Filipinos to express their voices, exchange ideas and explore their roots together as an empowered community.